In accordance with the Penal Detention Facilities Act the treatment of inmates is provided with aims to enable them to grow more aware of themselves according to their individual characteristics and environment, arouse their motivation to reform and rehabilitate themselves, and foster their ability to adapt to a social life while respecting their human rights. Fig. 2-4-3-1 shows the flow of treatment of inmates. 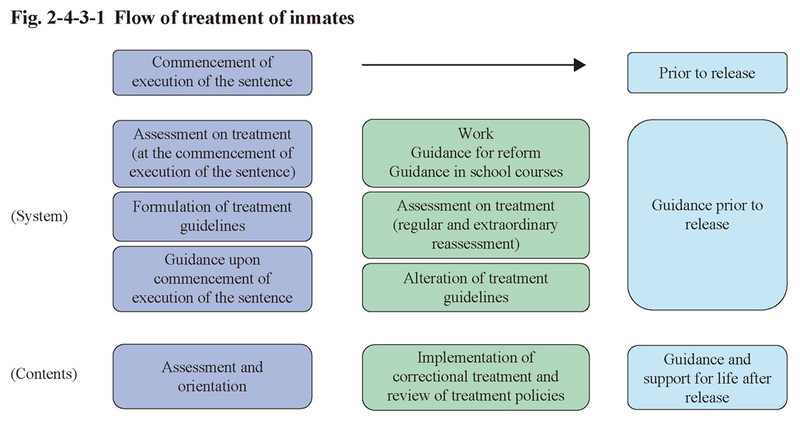 Work (See the next subsection), guidance for reform, and guidance in school courses (See Subsection 3) implemented as correctional treatment are the core treatment provided to inmates. Correctional treatment has to be provided according to the characteristics and environment of the individual inmates in an appropriate manner and of appropriate content (principle of individual treatment). The personal characteristics and environment of inmates (assessments on treatment) are therefore assessed at each penal institution through utilizing expertise and technology from fields that encompass medicine, psychology, education, and sociology. In addition, detailed assessments also take place at special institutions designated as assessment centers on finally sentenced inmates that are young and thus still sufficiently plastic minded or those who require more detailed assessments (inmates for sexual offenses, etc.) in thereby determining the manner in which special guidance for reform should be provided to them. At penal institutions assessments on treatment (including those from assessment centers) are conducted upon commencement of execution of their sentence and a treatment index is specified for each inmate which takes into consideration the results of the assessments. The treatment index is organized in terms of both the type and content of the correctional treatment and the characteristics and criminal tendencies of the actual inmate. 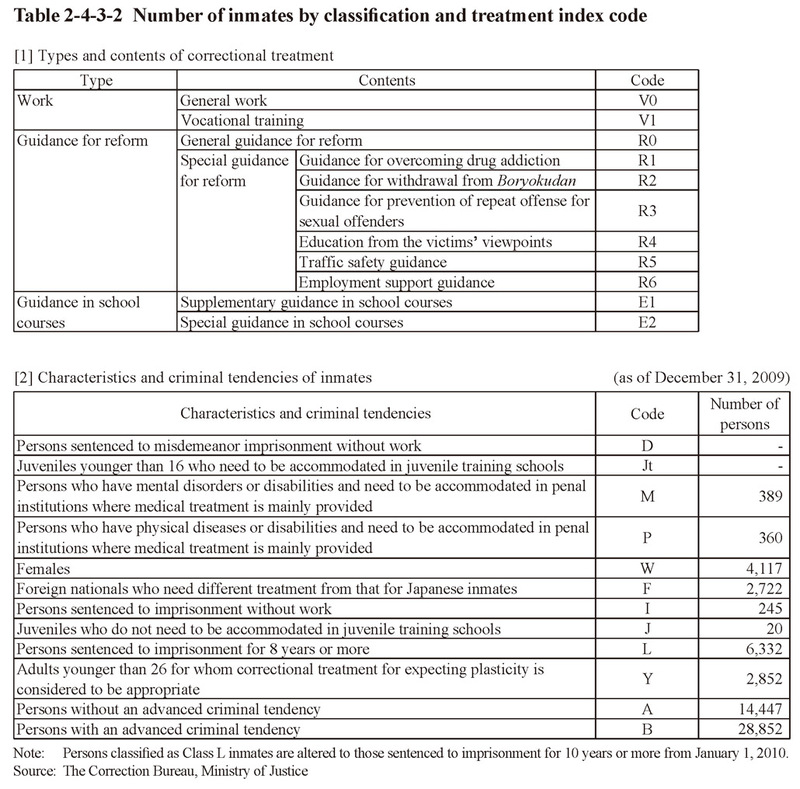 Table 2-4-3-2 shows the number of inmates by classification and treatment index code as of the end of 2009. If deemed appropriate multiple treatment indices can also be specified. For example, V0, V1, R0, and LA are specified for inmates without any advanced criminal tendencies who have been sentenced to imprisonment with work for 10 years or more and for whom receiving vocational training and general reformation guidance was deemed appropriate. The penal institution where the inmate is placed and priority of treatment appropriate to the individual inmate is then determined using that treatment index. For example, Class LA inmates are placed in penal institutions that specialize in holding Class LA inmates while Class R3 inmates are provided with guidance for prevention of repeat offense for sexual offenders. Correctional treatment is implemented based on treatment guidelines that specify the goals, basic content, and methods used in correctional treatment (for example, concrete methods, period, and frequency of guidance for prevention of repeat offense for sexual offenders, etc.) in accordance with the results of assessments on treatment which are conducted upon commencement of execution of the sentence. As described above treatment provided to inmates takes place in the following steps. The personal characteristics and environment of individual inmates are first assessed upon commencement of execution of the sentence. A treatment index and treatment guidelines are then specified based on the results of the assessments and treatment of inmates is implemented in accordance with them. Assessments on treatment can take place both regularly and when considered necessary, however, being in accordance to the progress made through the correctional treatment provided. The treatment index and treatment guidelines can also be changed based on the results of the assessments. Inmates have various restrictions on their daily lives and activities in penal institutions. Uniform imposition of severe restrictions on all inmates, however, can dampen their enthusiasm to act in a voluntary/self-motivated manner. 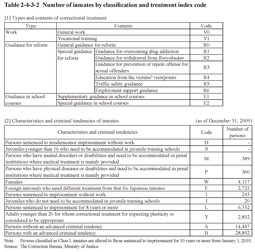 Restriction classifications ranging from Level 1 through to 4, which are according to the likelihood of them accomplishing the aim of their treatment (raising the motivation to reform and rehabilitate themselves and developing the capability of leading a sound social life), are therefore designated for inmates but which can be regularly or as the occasion demands changed. Inmates then have restrictions according to their restriction classification (for example, Level 1 inmates have unlocked cells, etc.). The result of examining 77 main penal institutions, eight branch prisons, and four large-scale branch detection houses (Sapporo, Yokohama, Saitama, and Kokura), being as of April 10, 2010, revealed that 466 inmates (0.7%) in these institutions were designated as Level 1, 4,445 (6.9%) Level 2, 51,666 (79.8%) Level 3, and 2,847 (4.4%) Level 4, while 5,282 (8.2%) had no specific designation assigned to them (Source: The Correction Bureau, Ministry of Justice). Those making efforts in reformation/rehabilitation are rewarded thus raising their motivation to do so. Inmates are therefore designated as being of Level 1 to 5, with the order being from good to bad, in a privilege classification that is accordance with an assessment made of their attitude toward their sentences every six months. Those classified as being considered capable of good behavior are provided with more opportunities to come in contact with the outside world and permitted access to a greater range of self-supplied articles, etc. The result of examining the abovementioned subject penal institutions, also being as of April 10, 2010, revealed that 278 inmates (0.4%) in the institutions were designated of a Level 1 privilege classification, 6,338 (9.8%) Level 2, 28,453 (44.0%) Level 3, 7,444 (11.5%) Level 4, and 8,321 (12.9%) Level 5, while 13,872 (21.4%) had no specific designation (Source: The Correction Bureau, Ministry of Justice). Inmates that meet certain requirements, such as being likely to accomplish the aim of their treatment and thereby receiving treatment in an open facility are permitted to temporarily leave penal institutions or spend no more than seven nights without having to be accompanied by an institution official when it has been considered necessary for them to visit someone outside to discuss securing a residence or employment after release or to maintain/adjust family relationships, etc., or if the need exists to visit a volunteer probation officer or anyone else related to their rehabilitation.